You are at:Home»Cycling»Does My Bum Look Big? For the last few years whenever Winter comes along I just start gaining weight. It's time for intervention via a mini-challenge. My primary 2008 Challenge won't be unveiled until January 1st, but I can't wait until then to stop this weight gain. For the last few years whenever Winter comes along I just start gaining weight. It’s time for intervention via a mini-challenge. My primary 2008 Challenge won’t be unveiled until January 1st, but I can’t wait until then to stop this weight gain. I eat way too much. Portion sizes are too big. And I love bread, cheese, pizza, bacon sandwiches, etc. Oh yeah, I also started cooking this amazing spaghetti pie recipe – too good and too fattening! Smaller portions. More salad, healthier foods, etc. PS – Always wear a helmet, even indoors. I noticed your site while keeping up with my buddy’s site BicycleFrenzy.com. Very nice. But, just like you, my problem stands through Christmas. 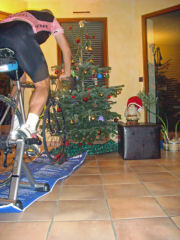 I’m trying to get time on the bike in this great weather but too much going on for Christmas preparations, etc. I’m thinking I’m going to have to stick my Tri bike on the trainer for some short spins in the evening. P.S. – What’s your beer of choice over there? Any beer from Belgium. I plan to become a Trappist Monk in my old age. They Pray, brew fantastic beer, then drink it — then repeat the cycle. I think God might be from Belgium. What a great goal — you have my full support! We’ll have to find healthier recipes….although I’d like to keep spaghetti pie in your repetoire!! Just say No to Beer!! ps-what’s that as % of current weight? I think your bum looks mighty hot. 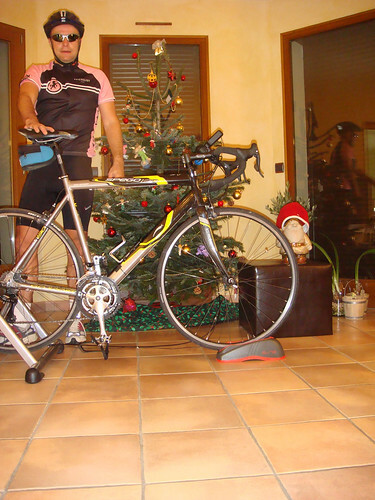 I’m not even capable of looking at a stationary bicycle at this point, let alone climbing up on one. Actually pedaling it is absolutely out of the question. p.s. did you tell the missis about your penchant for greasy kebabs?